i am a lefty: jever fun is so NOT fun! jever fun is so NOT fun! when i first arrived in Berlin, i made extreme efforts to be social, like going out on sundays to madame claude's a little hangout in kreuzberg. on sundays there would be this open mic in a little back cave hosted by some hipster with a really thick funny german accent. lotz of zzz's. zo, ze next muzician eez...that kind of thing. the other novelty of madame claude's was that it was in a basement, and by that some sort of topsy turvy world where all this furniture was glued to the ceiling, tvs are upside down, so are coat racks, you get the idea. as such, the beer menus were also upside down. fast foward 13 months, at the most recent frisbee tournament where they modestly priced 1€ Jever varieties in between games. 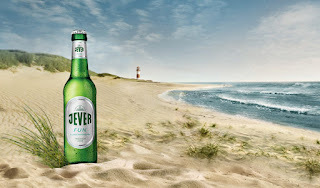 do you have jever fun?? i asked eagerly. why not? are you stupid? jever fun is non-alcoholic! why would we serve non-alcoholic at a frisbee tournament? though that question deserves an answer - i quickly sunk into a funk so deep, like finding out someone has been sneaking 5€ bills out of my wallet all these years. i've been duped! all those nights now making sense, and making an idiot of myself only powered by 0.05% or less alcohol that my grandmother would drink...the clean recollections of the night before, the tireness and barely mild mockable drunkenness. in fact. jever fun is ANTI-fun!